Samsung is set to launch its all-in-one HT-X810T Soundbar wireless home theatre system in the UK next month. 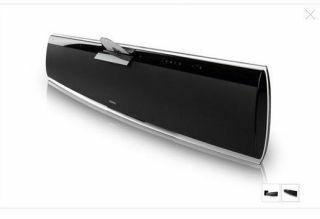 First shown at CES in January this year, the HT-X810T Soundbar system is supplied in two pieces – a single speaker ‘Soundbar’ that sports a built-in upscaling DVD player, plus a separate wirelessly operated sub-woofer. According to Samsung the Soundbar is specifically designed to sit directly below a wall-mounted flat-screen TV of 40-inches or more. Despite being a single unit, it’ll still produce up to 300W of 5.1 virtual surround sound, backed up by the low-rumbling sub, which can be positioned anywhere. The disc player on the front of the Soundbar unit is capable of upscaling standard DVDs up to 1080p, and can also process most audio and video formats including DVD-R, DVD-RW, DVD-A,WMV, WMA, DivX, JPEG, CD-R, CD-RW and MP3. The only notable absentees are, as might be expected, Blu-ray, SACD and DVD-OK.
Connectivity includes 5.8GHz wireless for the sub, plus USB, HDMI out, and Audio and Optical In. There are no Coaxial inputs though, and a humble iPod jack is sadly missing too. By way of scant compensation there is a in-built FM radio though. We did contact Samsung’s UK PR consultancy to ask how much UK customers might expect to pay, but they had absolutely no idea. Samsung themselves were also out of the building when we called.